Sato-umi is an expression used in Japan to describe the concept of a coastal community that exists in harmony with the sea. It means that the local way of life and environment have been shaped by both man and nature over time to support a mutually beneficial existence. Sato-umi is meant to be an evocative expression, and it also implies a place of natural beauty, timeless traditions, and a conscious effort by the community to preserve its unique way of life. The picturesque fishing village of Ine, which is spectacularly located on a bay of the Sea of Japan along the Tango Peninsula on the north coast of Kyoto prefecture, has this kind of symbiotic relationship with the sea. 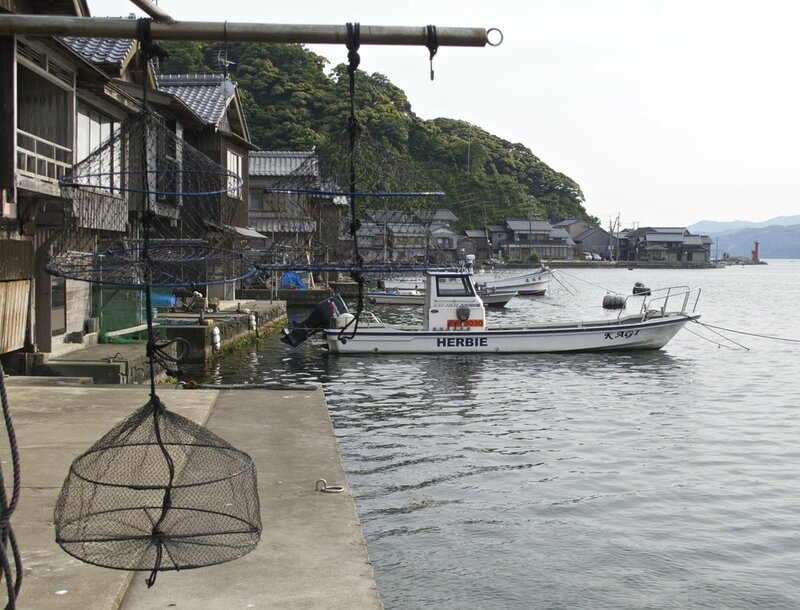 In fact, it is hard to think of any other coastal village in Japan that is more intimately, beautifully, and sustainably connected with the ocean or one where the fishermen have worked together so successfully over time to achieve this. A new, young generation of Ine's fisher families are continuing this tradition. They have opened up the village to visitors for the first time in its history and are implementing a community-coordinated program of marine ecotourism. There are boat tours of the bay, customized fishing trips, and morning excursions to the village’s informal beach market at the center of the village called the hamauri, where the fishermen’s daily catch is delivered. Wadatsumi, a sleek, yet causal, new sea-to-table restaurant offers sushi sets of freshly-caught fish for lunch and elaborate kaiseki course meals at dinner. At the heart of this program of renewal is the chance for small groups of guests to stay at the fishermen of Ine’s homes and experience their ancient way of life. 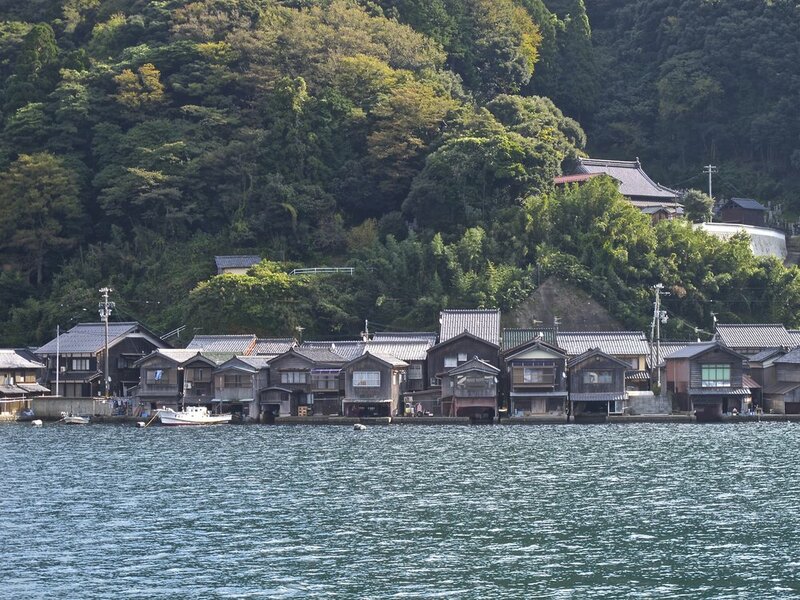 Called funaya, or boathouse-residences, the fishermen’s homes are unique in Japan for being built centuries ago on stilts over the water. Fifteen of the village’s two-hundred and thirty funaya have been converted into guesthouses. By keeping groups small, the fishermen can treat their guests like family. It also minimizes the impact of tourism on the daily life of the village. The fishermen and their families are eager hosts and will do what they can to make their guests' visits memorable, engaging them in the activities of the village or simply letting them relax at their funaya to enjoy its charms. A high point of a stay at a funaya are the delicious home-cooked meals prepared by the fishermen and their families using some of the best seafood available in Japan. Appearing as if they are floating on the pristine water of Ine Bay, the fishermen of Ine's unique funaya, or boathouse-residences, consist of a place to store their boats and work on the first floor and live with their families on the second floor. 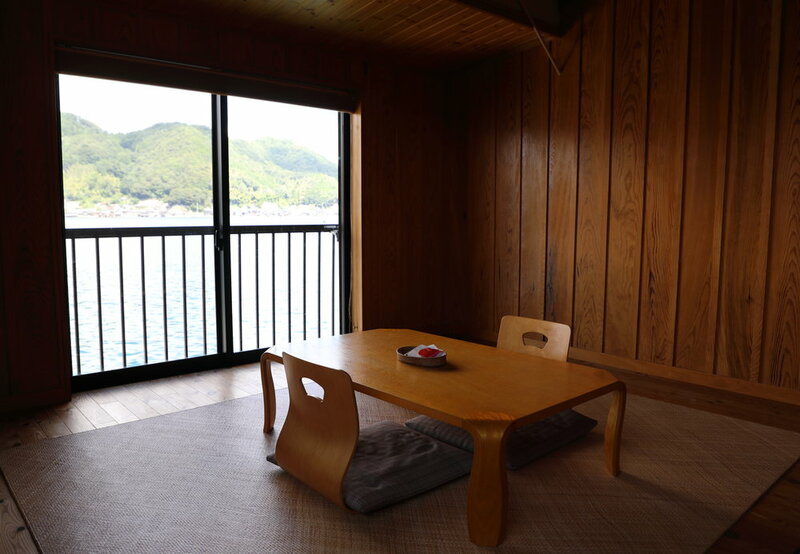 Looking out across Ine Bay from the first floor of a funaya, the simple wooden buildings of Ine blend in harmoniously with the land and sea. The intimately shared resource of the bay has fostered a strong sense of community among Ine's fisher families. Harunari Kura and his son Tsugichika operate a sea taxi service for visitors to Ine and also a funaya guesthouse called Kuraya. 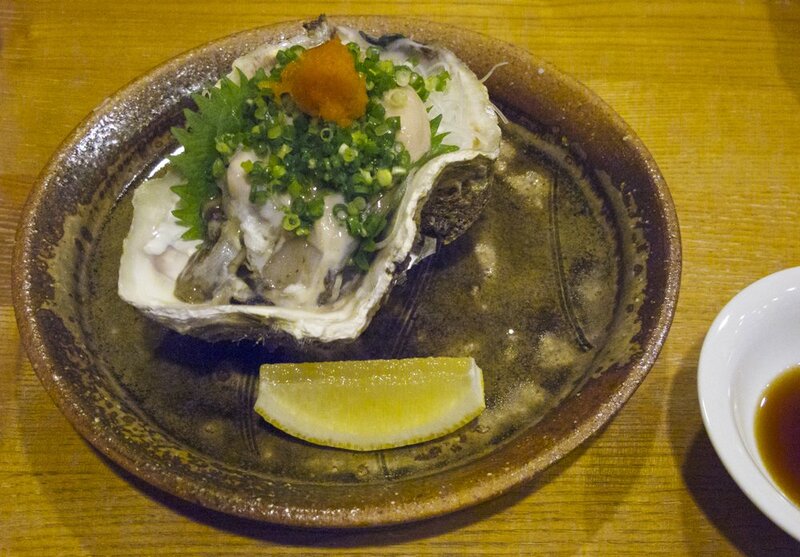 Here, Harunari is pulling in a rock oyster (iwagaki) for Kuraya's guests to enjoy as an appetizer before dinner. The Tango Peninsula, where Ine is located, is a large, square-shaped chunk of land that juts out into the Sea of Japan about two hours north of Kyoto. 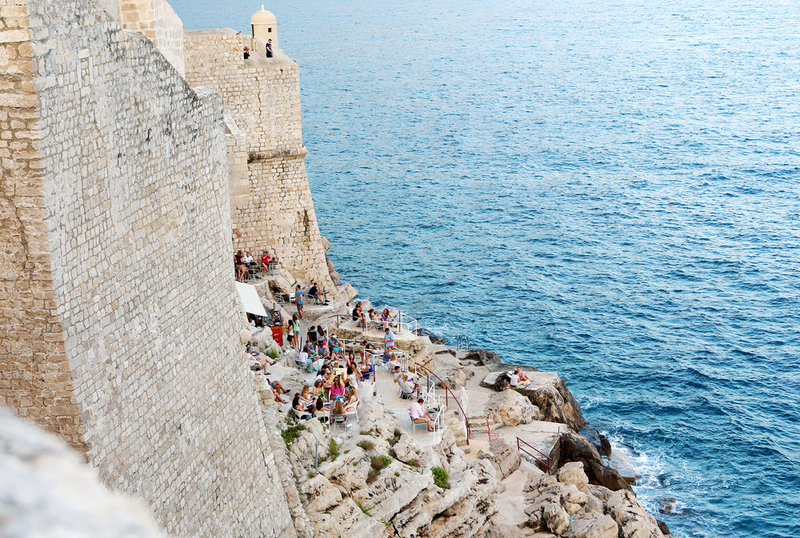 Its rugged coastline is one of the most dramatically beautiful in the country. Steep, thickly forested mountains either crash into the sea or end in abrupt cliffs, stony outcroppings, and island slabs of rock offshore. The Sea of Japan is a pristine, marine blue sea that is home to one of the richest, most diverse, and flavorful collections of seafood in the world. When fishermen first came to the region around 1,400 years ago from southern Japan and the western shores of east Asia, they chose the Tango Peninsula as their base because one of the sea’s three richest fishing grounds is located offshore where warm currents from the south and cold currents from the north meet over an underwater continental shelf, creating a fabulously fertile breeding ground for fish in the spring and a fattening, enriching one in the fall. Ine, a small village of just over 2,000 people, is one of the oldest fishing villages in Tango (as the region is known from the days when it was an independent kingdom) as fishermen were drawn to Ine Bay by its ideal fishing conditions. Notched into a crook of the Tango Peninsula, the small round bay is almost completely enclosed and is sheltered by steep mountains. A small opening facing south shields the bay from harsh cold winds that blow down across the Sea of Japan from Siberia during the winter. In summer, the bay is protected from typhoons coming from the south by a small hilly island at its entrance. The mountains that surround the bay are covered in thick forests, and for centuries Ine’s fishermen have believed that these forests attract fish to the tranquil waters of the bay by singing to them with the sweet, rustling sounds of their leaves. They call them uo-tsuki-rin, or fish-gathering forests, and so as not to encroach on them, the fishermen built their homes perched on stilts over the water. Unique in Japan, the village’s homes are called funaya, or boathouse-residences. The first floor is open to the water and houses the family skiff and is also used as a workspace. The second floor is the residence. Traditionally made of wood, thatched-plaster, and mud-tiled roofs, the funaya extend in a narrow line along the shore of the bay, creating an organic seam that beautifully and harmoniously binds the mountains and sea together. In the 20th century, the fishermen’s conservation practices were understood scientifically. The kind of mixed-tree forests that surround Ine Bay create streams of mineral-rich fresh water that coastal fisheries thrive on. The forests also prevent the runoff of sediment, which destroys fisheries. What was always obvious to Ine’s fishermen was that the pristine waters of Ine Bay were teeming with delicious seafood. There are shoals of herring (nishin), sardines (iwashi), and red snapper (tai), and also beds of clams (kai), mussels (muru-gai), abalone (awabi), sea urchin (uni), and rock oysters (iwagaki). Just outside the bay there is Ine's famous yellowtail (Ine-buri) and Spanish mackerel (sawara), exotic sharp-tooth snapper (itoyori) and rare red gunner (hobo), red-spotted grouper (kijihata), swordtip (shiro-ika) and bigfin reef squid (aori-ika), Taiza giant crab (Taiza-gani) and spiny shrimp (oni-ebi). Village residents catch their daily seafood by simply dropping a small cage, called a mondori, into the water below their funaya in the morning, and bring it up filled when they are ready to eat. Or they go out into the bay in small skiffs and line catch fish. To make their livelihoods, Ine's fishermen wild catch larger amounts of fish offshore along the coast outside of the bay by the practice of ama set-net fishing. Developed over 500 years ago in Japan, ama set-net fishing is a small-scale, low-impact, sustainable way of gathering seafood. The nets are constructed to catch only mature fish and are set at angles to trap only a modest number of fish that swim past. In addition, the fish are left in the tent-like net structures to thrive until needed, and only then raised fresh and healthy. Added measures to ensure the sustainability of the local seafood include demarcated fishing rights for each fisherman and quotas set annually by type of seafood. Fishing is considered a community enterprise, and every morning before selling their seafood at the fish market in the nearby port of Miyazu, the fishermen of Ine bring their daily takings to the village's hamauri beach market to first offer their takings to their neighbors. Villagers can get several pieces for free or fill a bucket for ¥100. All seafood is free for the elderly. Hanging in the left foreground is a small cage called a mondori, which every household in Ine uses to catch fish directly from their funaya. The skiff named "Herbie" moored in the background belongs to Kengo Kagi who runs a funaya guesthouse called Kaigya with his family. Abalone and sea urchin picked from the sea floor in front of the Kagiya funaya guesthouse. To preserve the forests surrounding Ine Bay, the village of Ine made its rice fields away from the bay, terracing them on the other side of mountains that surround Ine Bay. The ama set-net fishing lines the fishermen of Ine use to catch large fish outsie of Ine Bay can be seen in the water near the shore. Early every morning, three-to-four person mechanized boats go out beyond the bay to load seafood caught by the ancient practice of ama set-net fishing, a small-scale, low impact, and sustainable method of fishing. They bring their catch back to Ine's informal beach market called the hamauri to share their takings with local residents before selling the fish at the market in the nearby town of Miyazu. 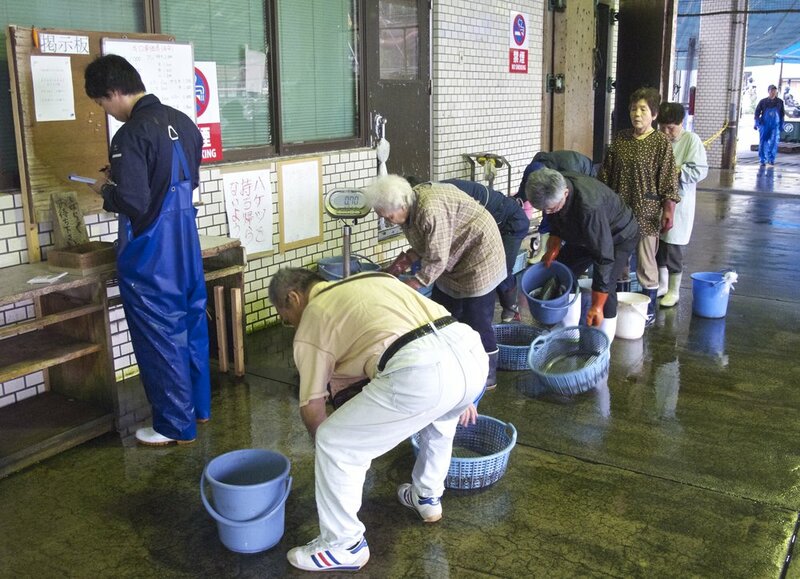 Ine's residents have first crack at selecting fish from the fisherman's daily catch at the informal hamauri beach market, getting the fish for free or ¥100 per bucket-full. Isolated and mutually dependent on the sea for their existence, the fishermen of Ine have long governed the village on a communal basis without a headman (until recent years when a mayor was required by the prefectural government). During the Meiji period (1868-1912), all of Ine's fisher families put their names to an informal contract committing them to the preservation of their way of life and the landscape in response to the industrialization that was sweeping across Japan following the opening of the country to the West. As a result, Ine today is a perfectly preserved working fishing village, complete with ancient Shinto shrines and Buddhist temples and small family-run shops, places to eat, and other businesses. There is even a sake brewery, the Mukai Shuzo Sake Brewery, which has been in operation since 1754. The biggest change in the past couple of hundred years was a road built in the 1930s that runs behind the funaya. (Despite the road, the fishermen still mainly use their boats to get around.) The new road allowed each villager to build an additional structure across the street from their funaya, which became either a new main residence (omoya) or store house. Built in the same traditional materials and style as the funaya, these newer buildings have similar architectural details. In recent years, Ine has faced two challenges. One is an aging and declining population, a problem that is besetting all of Japan’s country towns and villages. The other challenge has been how to make a traditional living in the face of competition from large, commercial fishing operations operating offshore. 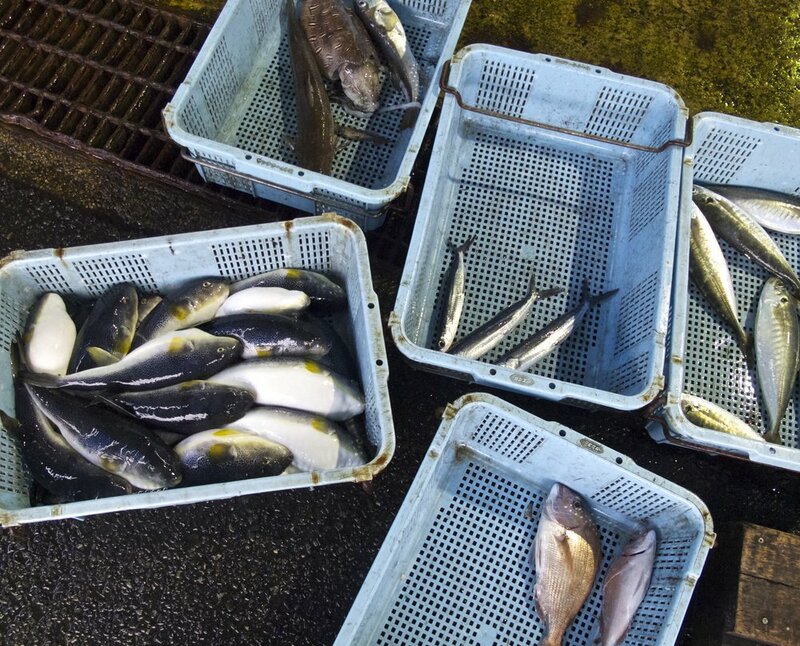 This problem has been especially acute for Ine’s younger fishermen, a number of whom have returned to the village after stints living in Japan’s big cities. The marine ecotourism solution that the fishermen of Ine came up with has been a remarkable success. The funaya guesthouses are full, and day-trippers as well as the overnight visitors have breathed new life into Ine's small businesses and prompted the creation of new ones like the excellent sea-to-table restaurant Wadatsumi. But there are no crowds or commercialism, and Ine has not become a theme park. Instead, the village’s main activity remains the boats that go out beyond the bay in the middle of the night to collect seafood from the ama set-nets, chugging quietly across the bay. This is followed by an early morning parade of villagers to the hamauri beach market, starting off with those on foot, followed by others on bicycles and scooters, and then cars that bring up the rear. The rest of the day Ine is a quiet place in which visitors can wander the village and admire its charms, go out on boats with the fishermen, hike cliff paths and explore neighboring villages and secluded beaches, or relax at their funaya. When a road was made in Ine in the 1930s, each villager was able to build a new structure across the street from their funaya, which became either a new main residence or store house. These newer buildings on the left above were constructed with the same traditional materials and styles as the older funaya on the left, preserving Ine's charming streetscape. All buildings in Ine are edged along the bay, including the Mukai Shuzo Sake Brewery pictured here. Founded in 1754, the brewery is famous because its master brewer Kuniko Mukai is a woman and also because she makes a unique rose-colored sake called Ine Mankai, which has a sweet-acidic flavor that goes perfectly with the rich seafood caught in the bay. Ine's success has been due to the efforts of fishermen like Kengo Kagi and Tsugichika Kura, friends and neighbors who recently returned to the village, bringing with them new skills and a passion to create value from Ine's ancient way of life and the sea's resources without exploiting them. 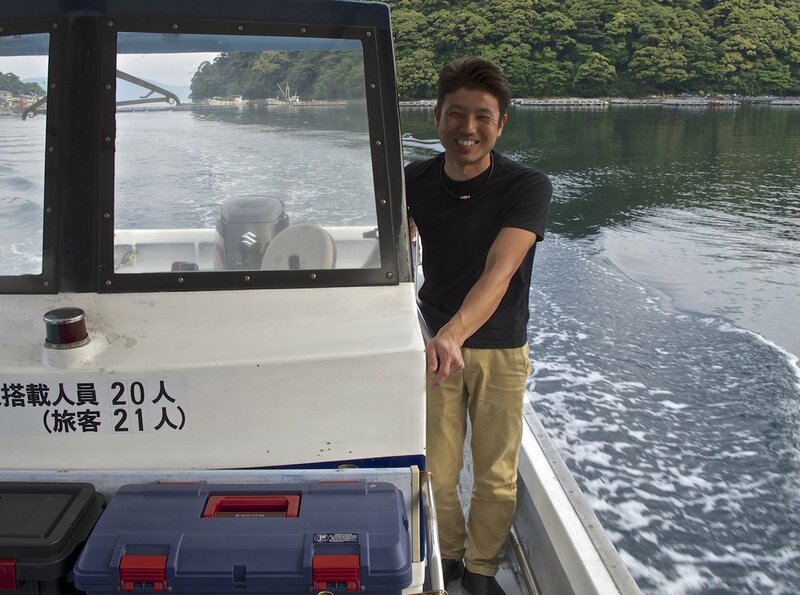 Kengo Kagi and his wife Mina have been leaders in developing Ine's marine ecotourism program. In addition to the guesthouse they opened a decade ago at Kengo's family's old funaya, Kengo is the president of the restaurant Wadatsumi and Mina oversees the Ine Cafe next door. Their son Shinsuke plans to open a bar at another funaya in the near future. The Kagis are restaurant and hospitality professionals, and their guesthouse is essentially a private boutique hotel with a great kitchen. When he was 20 years old, Kengo moved to Kyoto to train at a leading fugu restaurant, obtaining the required license to prepare this deadly but delicious winter fish. He also worked as a seafood distributor, supplying fresh fish to Kyoto restaurants, and attended a cooking class where he met Mina. After marrying, they both worked at her father’s sushi restaurant in Ibaraki prefecture north of Tokyo for fourteen years until they returned to Ine. They converted his family’s funaya into a guesthouse by turning the boat shed into a dining room with a glass wall facing out onto the bay. The old living space above became two comfortable bedrooms. (The Kagis live in their omaya main residence across the road like all funaya guesthouse hosts.) They take only one group of guests per night and can accommodate up to six people. Kengo initially thought to serve multi-course kaiseki meals like the ones he learned to prepare in Kyoto, but then decided that home-cooking was the best way to showcase Ine's rich, juicy, full-flavored seafood. Still, their cooking reflects their expert training, and they are creative in their dishes. Kengo gets seafood from the hamauri beach market each morning (guests can join him on this expedition), and also from right outside the funaya. The main show at dinner is a big platter of sashimi, expertly selected, skillfully prepared, and beautifully presented. 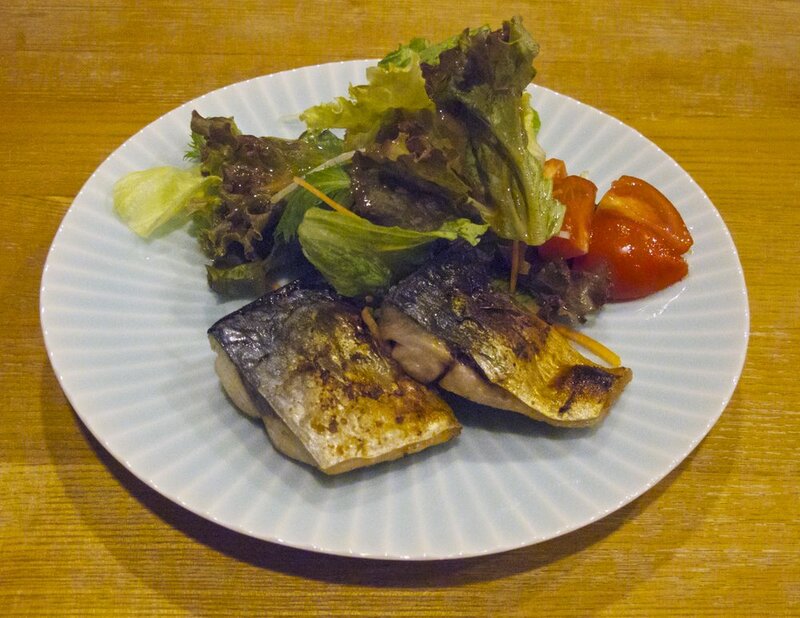 Other dishes might include ribbons of raw scorpion fish (kasago) in a sesame sauce, grilled Spanish mackerel (sawara), red snapper (tai) baked with mushrooms and Kyoto's famous kujo-negi leeks in olive oil and butter, a whole sardine (iwashi) braised in a salty-sweet nitsuke sauce with big slices of ginger, raw giant rock oysters (iwagaki) accompanied by spicy grated daikon radish, green onions, lemons, and ponzu sauce. Dinner ends with a nabe hot pot, which in summer might be dagger-tooth pike conger (hamo) and oysters in a miso stock. 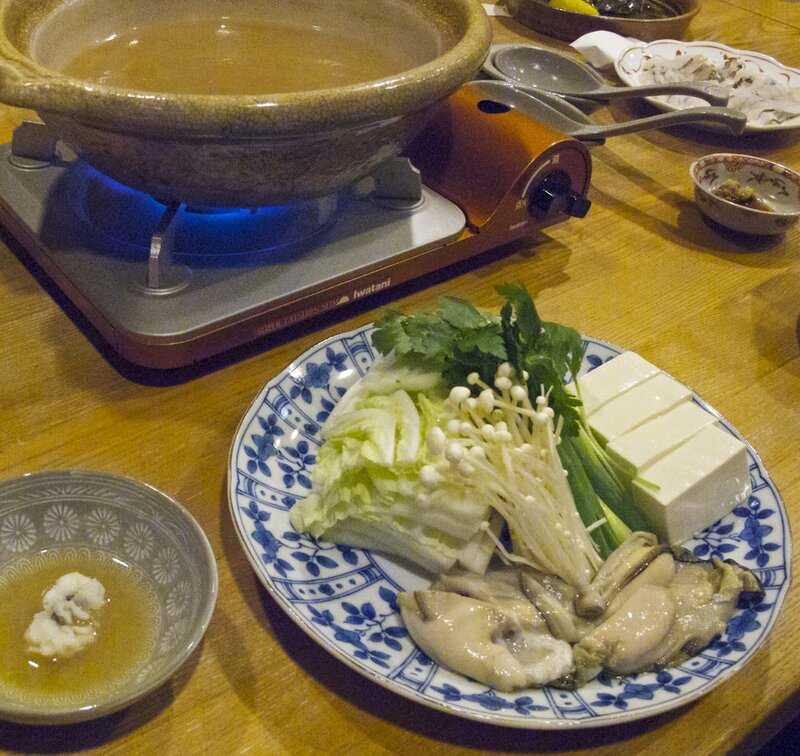 In winter, it is always the Ine specialty of yellowtail shabu-shabu hot pot. Guests can choose to stay at Kagiya without a meal, but it would be a shame to miss their excellent cooking and warm hospitality. When you arrive, Kengo will offer to take you by boat to the Mukai Shuzo sake brewery across the bay to do some sake tasting and also buy a bottle to bring back for dinner if you find something you like. Or he can take you on a boat tour of the bay or lend you snorkel masks, flippers or a kayak if you want to explore the bay on your own. The entrance to Kagiya guesthouse. From let to right: Kengo, Mina, and Shinsuke Kagi. Kengo selecting fish for the guesthouse at the morning hamauri beach market. A summer platter of sashimi that includes red gunner (hobo), sharp-tooth snapper (itoyori), red-spotted grouper (kijihata), tilefish (amadai), and Japanese horse mackerel (aji). The still glistening eyes of the fish indicate their freshness. At Kaigya the front room upstairs has a view of the bay and can sleep two people when the futons are rolled out at night. The large room upstairs in back at Kagiya can sleep up to four people. Depending on the size of your group, you can keep this as the bedroom and use the other room in front as your lounge. After living in Osaka for a number of years, Tsugichika Kura returned to Ine, where he now operates a sea water taxi service with his father Harunari and also helps him raise rock oysters (iwagaki) in the bay. The sea taxi service is available to pick riders up and drop them off anywhere in Ine at a phone call's notice. It also offers boat tours of the bay and customized fishing trips to prime spots located outside of the bay along the coast of the Tango Peninsula. Together with his wife, Tsugichika also runs a funaya guesthouse called Kuraya. Similar to Kagiya, it has a large dining area downstairs with a deck off of that. There are two bedrooms upstairs plus a full bathroom, which faces out onto the bay. A deep soaking tub in the bathroom is made of Shigaraki-yaki, one of Japan’s oldest types of stoneware, and is an especially relaxing place from which to watch the light play on the bay and listen to its waters lapping below. Kuraya offers excellent seafood meals, with dinner and breakfast included on request. Guests can start their evening with drinks on the deck outside the dining room and rock oysters (iwagaki) that Tsugichika or his father will collect that moment from the family’s oyster beds. Kuraya can accommodate one group of up to six guests per night. Tsugichika Kura operates a sea taxi service as well as his guesthouse and will take guests across the bay to Wadatsumi resaurant to have dinner there instead of at the funaya, if they choose. The Shigaraki stoneware bathtub at Kuraya is placed overlooking the bay so that guests can enjoy a traditional Japanese bath with a view. Breakfast at Kuraya is grilled seasonal fish along with a variety of other dishes. Kuraya's boat tours and fishing excursions are a great way to experience the bay. The funaya of Ine seen from the water. In the past, only the village's Shinto shrines and Buddhist temples, like the one pictured on the hill on the right, were built into the sides of the surrounding mountains because the mountains were considered sacred. Ine is a great place to visit anytime of the year. The peak months for seafood are from November through March, when the fish is at its fattest and richest and Ine's famous buri yellowtail, fugu blowfish, and Taiza giant crab are in season. In May there are schools of leaping dolphins in the bay by day and the dazzling blue glow of sea sparkle from the plant plankton called Noctiluca scintillans at night. During the last weekend of August, the village holds a fireworks festival when the fishermen light up the bay with paper lanterns hanging from their funaya. Near the entrance to the village is a quaint, very small-scale shopping district (called the Ine Ginza by local residents), which has a number of small restaurants and shops selling take-out bento boxes. Wadatsumi, the village's sophisticated yet casual kappo-kaiseki seafood restaurant is open for both lunch and dinner. The village's Michi-no-eki, or marketplace, is located on a rise behind the center of town with a view overlooking the bay. It has a parking lot in case you've arrived by car and also a cafe, restaurant, and shop selling local crafts and food. A local specialty you can buy here is heishiko, which is preserved codfish that has been cured in salt and rice bran. Ine is a member of "The Association of the Most Beautiful Villages of Japan," a non-profit organization that was formed in 2005 to help preserve and promote the enjoyment of Japan's traditional rural villages. (http://utsukushii-mura.jp) Utsukushii-mura, as it is known in Japan, is part of a broader global organization that includes similar associations in France, Italy, Belgium, and Canada. Dinner at a funaya during winter consists of Ine's famously rich and fatty yellowtail (Ine-buri) and giant Taiza crab served several ways, including as sashimi, tempura, and shabu-shabu hot pot—a local specialty in which the seafood is lightly cooked in a rich dashi broth and then dipped into a variety of sauces. One of the fun things to do at Ine in May is throw stones into the bay at night and watch the sea sparkle flash its fluorescent blue light. The best way to get to Ine is by bus from the train stations at the nearby towns of Amanohashidate or Miyazu. Buses leave approximately every hour and the ride takes just over an hour. You can get to Amanohashidate and Miyazu by train or bus from Kyoto and Osaka. 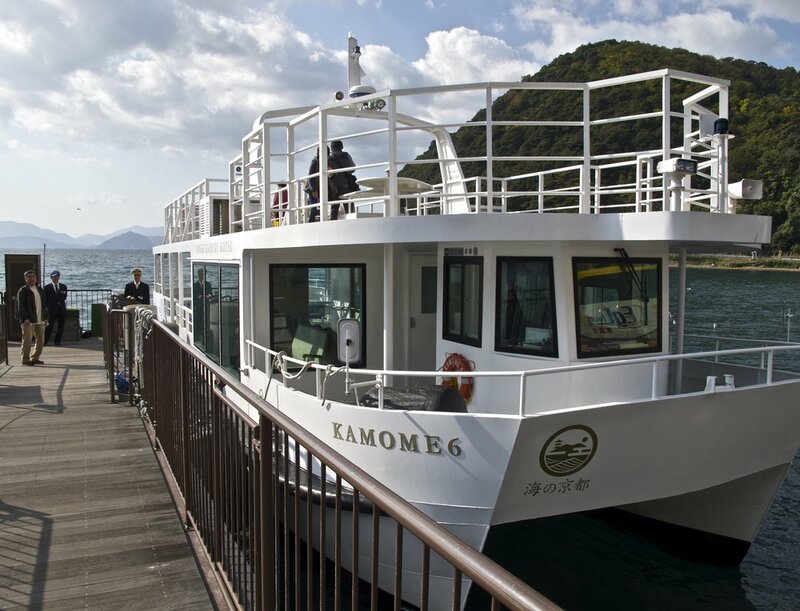 From April 29 to November 5 it is also possible to go to Ine by ferry boat on Saturdays, Sundays, and holidays from the main piers at Amanohashidate and Miyazu. Again, the ride takes about an hour to reach Ine. Once in Ine you can rent a bicycle, take a boat tour of the bay starting from the village's main public pier located next to the bus station, hire a sea taxi, or simply stroll around. It takes about 45 minutes to walk from one end of the village to the other. Amanohashidate, the pine-covered sandbar known in Japan as the "bridge to heaven" and considered one of the country's Three Scenic Views is a convenient gateway to Ine. Boats docked at Ine's main public pier next to the bus station are available to take you on a tour of the bay. The English section of the village's website provides helpful information on how to get to Ine, what you can do there, and places to eat. Web: http://www.ine-kankou.jp/english/ It also provides a nearly complete list of the funaya guesthouses with links to their websites, where you'll find instructions on how to contact them to make a reservation. (Not listed on the English section of the villages's website are four funaya—Shio no Kaori, Ameya, Yoshimuraya, and Taisei—that only accept Japanese-speaking guests.) 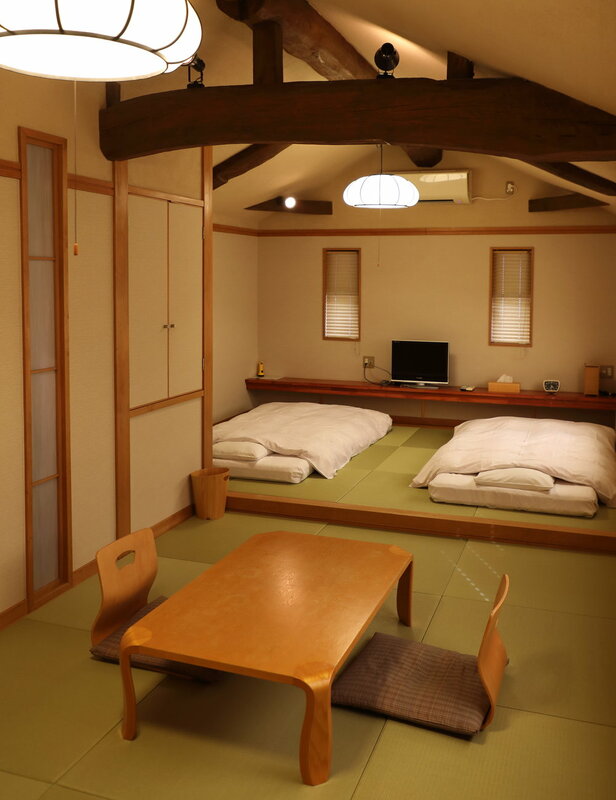 Most funaya are Japanese-style—futons or low beds on tatami mats. 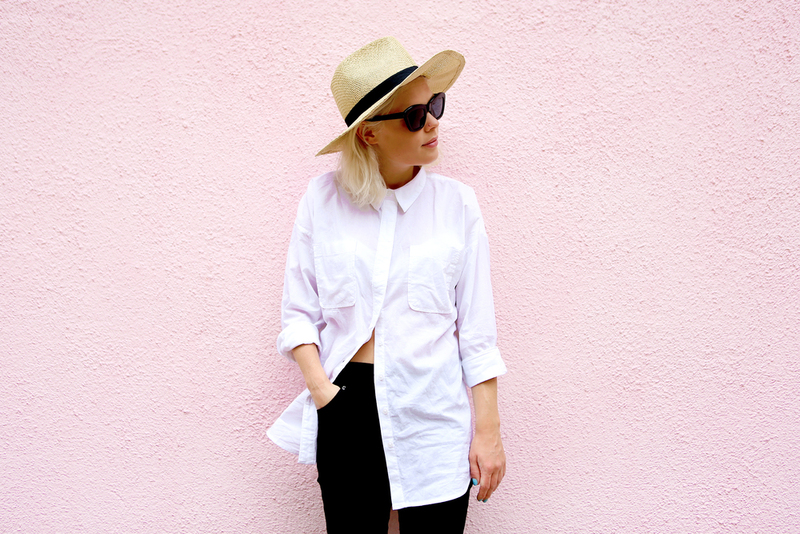 They offer a range of packages, which can include dinner and breakfast. Ine's website lists several funaya and inns just outside the village. Two of these are Okuine Onsen Aburaya Honkan and Okuine Onsen Aburaya Bekkan Nagomitei, which are located on the cliffs about a 10-minute drive around the bend going south from Ine. The former is a large complex that serves huge portions of local seafood to guests in a large tatami-mat room. 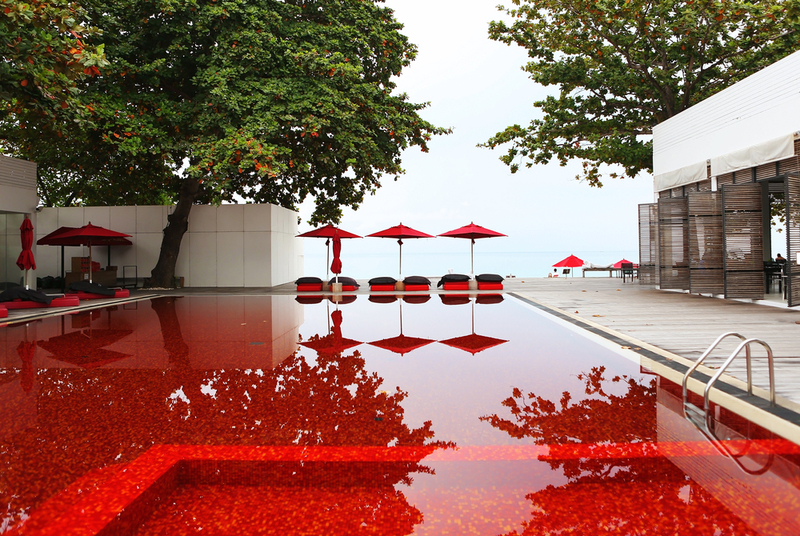 The latter is a smaller, more discrete inn where each room has its own outdoor bath and the menu changes daily based on what the chef finds in season. Both are good places to stay if you can't book a funaya. The winding, twisting coastline of the Tango Peninsula offers both spectacular sunsets and sunrises like this sunrise seen from a room at Okuine Onsen Aburaya Honkan, a large ryokan perched on a cliff about ten minutes south of Ine by car. The Tango Peninsula stretches from the hot spring resorts of Kumihama Bay in the south, around the dramatic coastline where Ine is located, and ends at the port town of Miyazu and the nearby pine-covered sandbar of Amanohashidate, known as the “bridge to heaven” and considered one of Japan’s Three Most Scenic Views. It is one of Japan’s oldest settled regions, and by the 7th century, the area had become a power center called the kingdom of Tango. In addition to the small fishing villages along its coast, the peninsula is filled with ancient Shinto shrines and kofun burial tombs as well as large plateaus of rice fields and quiet farm towns. The Tango Peninsula is part of the region called "Umi no Kyoto" or "Kyoto by the Sea,” which is one of three distinct regions of Kyoto prefecture that produce artisanal foods and crafts that feed the kitchens of Kyoto and fill the city’s shops. Seafood and rice are the main foods produced in Tango. The area is also known for its rice-based artisanally-made foods including small-batch sake (jizake), soy sauce, and what is considered Japan’s best artisanal rice vinegar “Fujisu,” made by the Iio Jozo Brewery in Miyazu. The region’s main craft is weaving silk fabric, which was first done in and around the towns of Kyotango, Yosano, Amino, and Taiza about 1,200 years ago. It is a cottage industry still done largely in small workshops and people’s homes. Of the silk fabric produced in the area, the most famous is Tango Chirimen, which is a uniquely woven type of silk crepe developed 300 years ago. It is a slightly textured silk fabric made by alternately weaving the warp, which uses untwisted raw silk, and the weft, which uses raw silk twisted about 3,000 times per meter. The result is a fabric that is softer than regular silk and which diffuses light in ways that give the fabric rich, vibrant hues. Because of its excellent seafood and scenic beauty, the Tango Peninsula has been a holiday retreat for the citizens of Kyoto and Osaka since the late Edo era. Today there are natural hot springs resorts and small secluded inns throughout the region, making it an excellent place to visit. It’s also convenient, being a leisurely two-hour ride from Kyoto by car or public transportation. 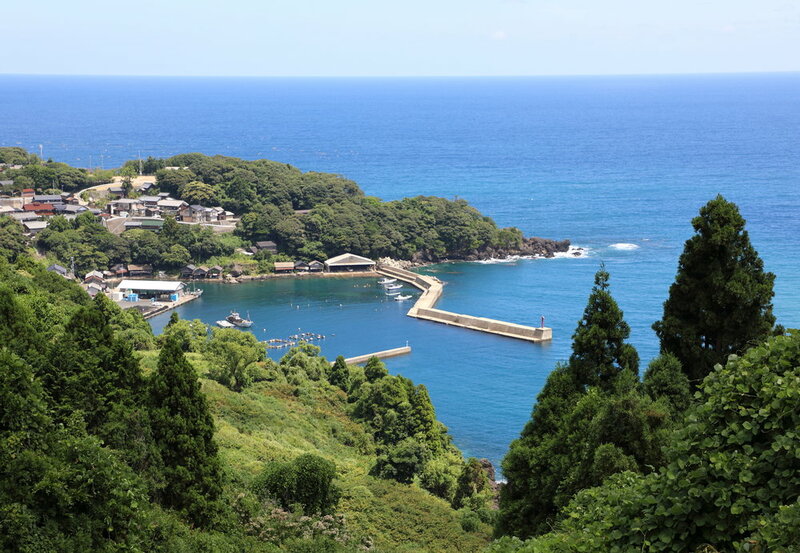 The tiny fishing village of Nizaki is one of many along the coast of the Tango Peninsula. The interior of the Tango Peninsula is filled with large plateaus of rice fields and small farm towns where many residents weave fabric in their homes and at small workshops. Daimaru Soy Sauce Brewery is an artisanal maker of soy sauce established in 1908, located in the tiny farming village of Mineyama. The current brewer is third generation Sayoko Hirano, a rare woman brewer in the industry. A cafe in the brewery is a delightful place to stop for lunch if you're exploring the backroads behind the coast of the Tango Peninsula. Jukaitei and Taiza Onsen Sumihei are two small, well-run inns located opposite one another on a hill outside of the fishing village of Taiza. Both inns have excellent restaurants, hot spring baths, and all rooms facing the sea so that guests can enjoy the spectacular sunsets. The entrance to Jukaitei, an inn located near the fishing village of Taiza. Seasonal offerings at the start of a multi-course dinner at Jukaitei. Tamiya Raden is a small, specialty maker of incredibly beautiful Tango Chirimen silk crepe that incorporates seashell (raden,) lacquerware, wood, leather, and vinyl into its fabric. These unusual materials are cut into micro-thin slices and pasted onto the back of washi paper, which is then cut into threads and woven into the weft of the silk. Working out his family home in the countryside behind the fishing village of Taiza, third generation weaver Kyoji Tamiya primarily makes obis with the fabric but also designs other items of clothing that have been featured in fashion shows in Paris and worn by the Japanese Imperial family. Kyoji Tamiya in the workship in his home. Fine threads of lacquerware, vinyl, and leather ready to be woven. An obi made of blue silk and seashell threads creates an expressionistic image of the sea.